One of the chief reasons that Wonderland stands out as, literally, a wonderful place is watching how all of the creatures and the land itself seems to defy all the rules that we’ve gotten completely wrapped up in here in our own world. Here, we have ritual and a huge helping of societal expectations that govern how we do just about everything. Wake up at a reasonable time. Brush your teeth for 30 seconds each way, rinse, and repeat. Wear pants. Ugh! There are just so many things tying us down! Which is why, of all creatures in Wonderland, the Cheshire Cat has the most to teach us. He knows exactly how to break the rules and define our own life! 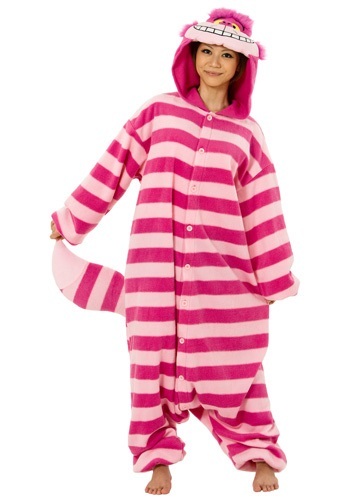 That is why this Cheshire Cat Pajama costume exists. Wiping that grin off your face will be kind of hard while wearing these Cheshire Cat pajamas. Not only because you'll feel cozy and warm, but you know the rules—no wearing pajamas out in public! But, nobody is going to stop you when they see this officially licensed button up, pink striped, fleece jumpsuit with the iconic Cheshire Cat character face grinning on the hood. Pave your own rules in this stoic society and, heck, we might just have a national pajama holiday before long! Wouldn’t that be niiiice! ?